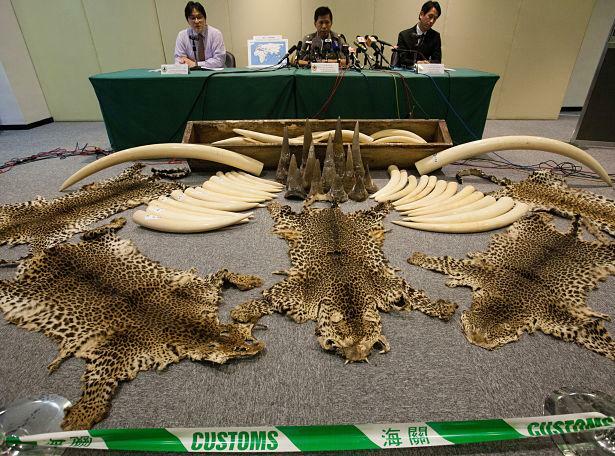 [caption id="attachment_7535" align="aligncenter" width="615"] Seized ivory tusks, rhino horn and leopard skins, with a street value of around four million Euro, are seen at the Hong Kong Customs and Excise headquarters in Hong Kong, China, 08 August 2013. This large seizure of wildlife products bound from Nigeria was disguised as timber inside two containers. It is the latest in a recent surge of wildlife seizures that underline Hong Kong's role as a pivotal transhipment point for illicit wildlife products bound from Africa to a booming underground market in mainland China. The growing middle class in China is driving the market for carved ivory trinkets made from elephant tusks, as well as rhino horn which is taken as a so-called aphrodisiac or medicinal tonic. The illegal trade is driving many iconic African animal species to extinction, as well as funding armed terrorist groups in the horn of Africa. [/caption] Hong Kong is a major hub for the wildlife trade and its free trade status is driving species to extinction, a meeting of 17 NGOs, experts and academics said on May 5th. “Hong Kong places minimal restrictions on international trade, but we nonetheless have an ethical responsibility to make sure we are not facilitating the disappearance of species globally,” said Dr. Yvonne Sadovy, professor of biological sciences at The University of Hong Kong. The organizations met at the university to discuss the urgent challenges presented by the wildlife trade, which is the fourth-largest illegal trade in the world, according to TRAFFIC, the wildlife trade monitoring network. The top three, narcotics, counterfeiting and human trafficking, have been taken seriously by the Hong Kong government, according to Amanda Whitfort, a professor of law at HKU. “Hong Kong government has only scratched the surface of regulating the wildlife trade,” she said. “The scale and variety of species involved is staggering.” Gloria Chang, Greenpeace East Asia said that “the importance of Hong Kong to both the parallel legal and illegal wildlife trade globally has clearly been underestimated.” Globally, the illegal wildlife trade is estimated at HK$ 147 billion (US$ 19 billion). 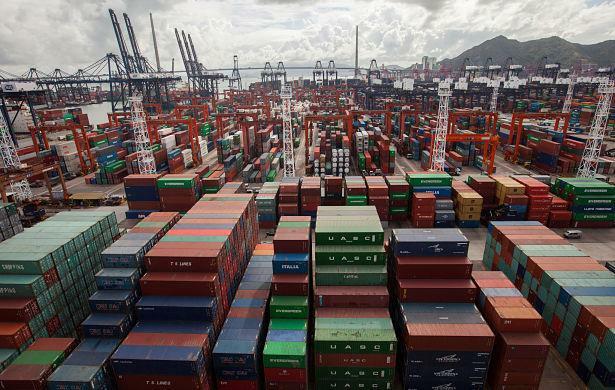 The group of experts said they were concerned about Hong Kong’s role in the trade. Trade in and through Hong Kong includes illegal ivory and rhino horns, often used as ornaments, medicinal plants and pangolins, used in traditional Chinese medicine. 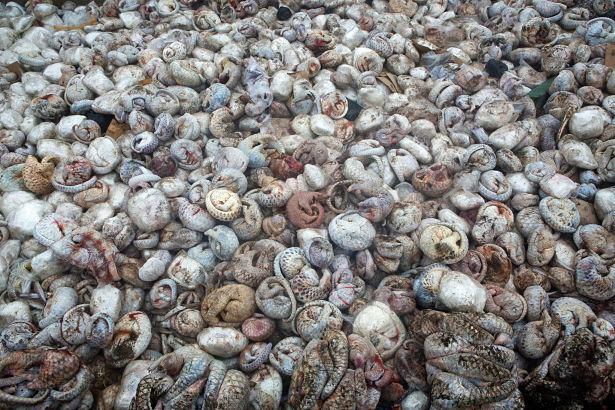 [caption id="attachment_7538" align="aligncenter" width="615"] 5 tons of frozen pangolin are pictured in a pit before being burnt after a huge pangolin seizure in Indonesia that was on route to Hong Kong or China via Vietnam, 29th April 2015. Photo: Paul Hilton for Wildlife Conservation Society[/caption] Five tons of pangolin scales seized in Hong Kong in 2014 illustrates the role the city is playing in the global demise of this endangered species, said Paul Hilton, WildLifeRisk. Other products include reptiles and birds for pets and luxury fashion, freshwater turtles and marine species for food, exotic timber for furniture. At the same time, Hong Kong accounts for over 50 percent of the global live reef fish trade and 50 percent of the shark fin trade. “Exact data on the exotic pet trade in Hong Kong are lacking”, said Dr. Fiona Woodhouse, SPCA (HK), “but the numbers of animals imported are estimated in the hundreds of thousands each year. We believe many are illegally sourced and that the legal trade is a conduit for smuggled animals.” According to a 2014 Civic Exchange report, “Taking from the Wild”, 30 percent of timber shipped into or through the city is illegally sourced. This included a seizure last year of 92 tons of endangered Rosewood - the largest case of smuggled logs of the past decade. Hong Kong also has the largest illegal stockpile of ivory globally since the 1970s and the government has committed to burn this stockpile through next year. “Three of the largest seizures since 2000 occurred in 2013,” said Dr. Yannick Kuehl of TRAFFIC. “The increasing size of the seizures indicates there are significant sums of money and organized crime involved.” [caption id="attachment_7536" align="aligncenter" width="615"] A general view of the port of Hong Kong where Hong Kong Customs officers seized an illegal shipment of ivory tusks, rhino horn and leopard skins, with a street value of around four million Euro, Hong Kong, China, 08 August 2013. This large seizure of wildlife products bound from Nigeria was disguised as timber inside two containers. 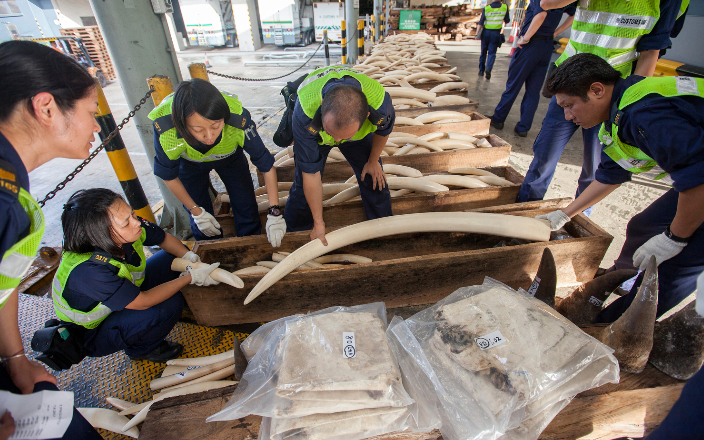 It is the latest in a recent surge of wildlife seizures that underline Hong Kong's role as a pivotal transhipment point for illicit wildlife products bound from Africa to a booming underground market in mainland China. The growing middle class in China is driving the market for carved ivory trinkets made from elephant tusks, as well as rhino horn which is taken as a so-called aphrodisiac or medicinal tonic. The illegal trade is driving many iconic African animal species to extinction, as well as funding armed terrorist groups in the horn of Africa. [/caption] Despite this, Hong Kong customs has said it only has the manpower to search 1 percent of the 22 million tons of sea cargo that pass through Hong Kong port annually. “Weak enforcement and legal loopholes are contributing to a mass extinction risk that is unprecedented,” according to Alex Hofford of WildAid. “The Hong Kong government is in a position to avert the continued loss of threatened species such as elephants, sharks, pangolins and manta rays-to name a few.” Among the experts’ recommendations was for the government to establish, immediately, a wildlife crime task force, a model that has been successfully adopted overseas. The task force should include the Hong Kong Police Force, the Agriculture, Fisheries and Conservation Department and the Customs and Excise Department, as well as other relevant expertise, they said.